Kevin O’Donnell and Michael Lombardi are the co-executive chefs and owners of SRV, a Venetian inspired restaurant in Boston’s South End. They met in Orvieto, Italy as lowly kitchen interns, where their shared love for making pasta and Italian culture overrode their stark differences. Kevin moves around the kitchen like a gazelle, while Mike barrels around like he’s trying out for JV football. Mike takes ten minutes to do his hair; Kevin runs his fingers through his salt and pepper mane once and he’s good to go. 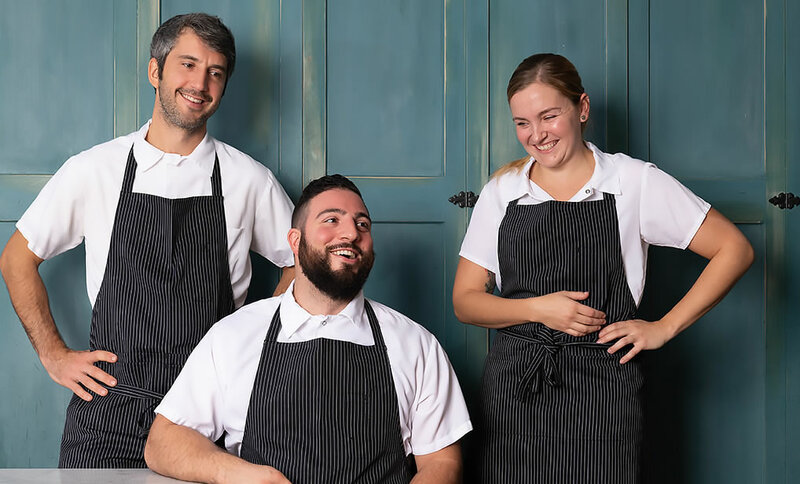 How did these crazy kids team up to make some of the most exciting Italian food in the northeast? After working under Mark Ladner at Del Posto in New York, the boys jetted back to Europe to open L’Office, which won Best New Bistro in Paris in 2012. In 2015 they reconvened in Boston and joined up with restaurateur Jim Cochener at The Salty Pig, where they marinated on their next move. SRV opened in January 2016 with a modern interpretation of Venetian cuisine, from hors-d’oeuvre like cicchetti to larger pasta courses, all the grain for the latter being milled in house. SRV won Boston Magazine’s Best Italian Restaurant award two years in a row and was a James Beard semifinalist for Best New Restaurant. One diner crowned the baccala, the whipped salt cod on squid ink crostini, the best fish shmear in the universe. It turns out this diner was also an SRV server looking to ingratiate himself. No matter! The chefs have a gift for making complex flavors simple and delicious, and making seemingly simple dishes burst with surprise and complexity. Growing up in Connecticut, Meghan could be found in her home kitchen baking alongside her Mother as early as six years old. In these moments, Meghan’s passion for pastry flourished and she developed a clear vision for her future in the culinary arts. Meghan soon pursued a degree in Culinary Arts and Hospitality Management from Newbury College. While attending college, she accepted a role at The Country Club in Brookline where she grew from Prep Cook to Lead Line Cook and ultimately, Assistant Pastry Chef. 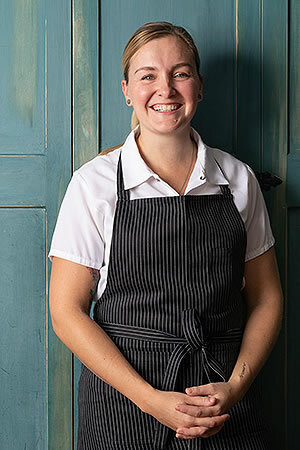 Meghan served as opening Pastry Chef of Steel & Rye in Milton where she further developed her style, which is built on attention to rusticity, seasonality, and whimsy. At Townsman, Meghan continued to hone her craft, creating handmade breads and desserts that showcase classic technique, yet still evoking that nostalgic feeling of eating your favorite dessert as a young child. Now two years into SRV, Meghan continues her passion and love for baking and pastry while working with fresh milled grains for all the breads, changing up the gelato menu and working closely with Chef Kevin & Michael for Venetian inspiration. Tyler, a native of Massachusetts, attended Johnson & Wales while working full time in multiple restaurants around the area. 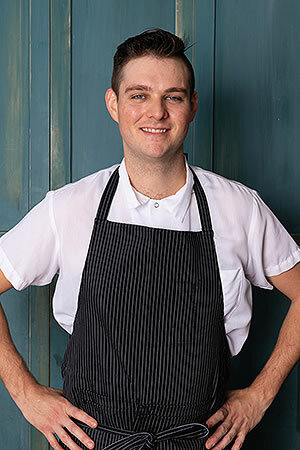 Upon graduation, he landed an internship at Frank McClelland's flagship restaurant, L'espalier. After much hard work, he was promoted to sous chef at Sel De La Terre Back Bay honing his skills on French cuisine. 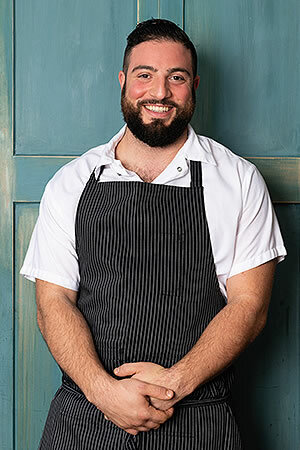 Always looking for new challenges, he eventually moved to Canary Square within the Coda group, where he met Michael Lombardi and discovered a love for Italian cooking. 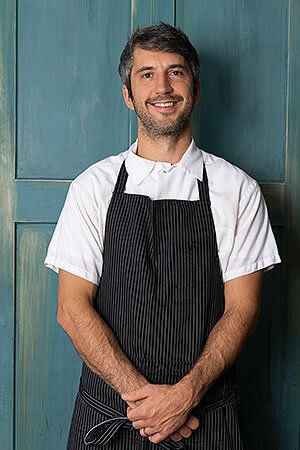 From there he opened SRV as a sous chef, and was then promoted to Chef De Cuisine.